The ANSI Z358.1-2014 international standard stipulates that emergency safety showers must deliver 15 minutes of tepid water to treat a casualty in the event of accidental exposure to contaminants. Tepid water, between 16-38°C, offers the optimum temperature range to enable a casualty to remain under a safety shower for at least 15 minutes to ensure a thorough decontamination. At temperatures above 38°C (100°F) there is the added danger of scalding and increased absorption of harmful chemicals into the skin. In extreme hot climates, such as the Middle East, this can be challenging due to solar radiation heating the water within the pipes or tank of the safety shower to dangerous levels. So, what are the options in such environments to ensure the provision of tepid water? How can I ensure my safety showers provide tepid water in extreme conditions? 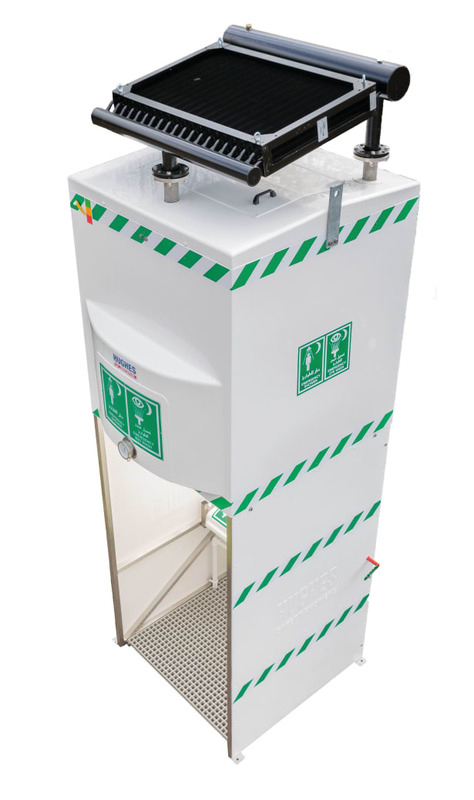 Emergency tank showers can be fitted with a chiller or cooling system to maintain the water in the tank at temperatures within the ANSI compliant range. Tank showers are perfect in environments where a constant supply of water cannot be guaranteed, equally if there is insufficient water pressure or inadequate flow rates these models are essential. 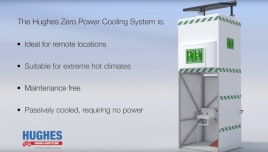 Hughes provides a range of cooling options suitable for both hazardous and non-hazardous environments. However, in many remote regions it can be difficult to provide a reliable power source for the chiller units. With the latest innovation from Hughes, the Zero Power Cooling System, this is no longer a problem. The system works in two phases: It reduces the impact Showered with Assurances Providing tepid water first time, every time, whatever the climate of high ambient temperatures in the daytime and cools the water in the tank during the night, ensuring the delivery of safe and tepid water without the need for power and with zero running costs. Alternatively, where there is a constant water supply, self-draining safety showers should be specified for hot climates. The design of these showers allows the standpipe to only fill with water when the shower is activated and drain when the valve is closed to prevent stagnant water in the standpipe overheating from solar radiation, thus removing the risk of further injury to the operator.